Volunteer of the Year-Joy V.
Keyuna Carter delivered a child as a young teenager. At 15, she got her first job making minimum wage. Once she finished high school, she continued to work a string of jobs in the retail and customer service industries, but she knew she needed to attain a higher paying job. 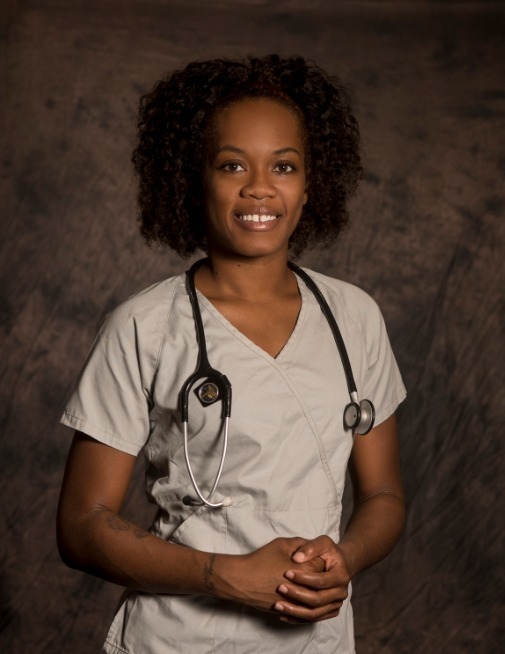 One day while receiving assistance with food at Sharing Life, Keyuna noticed the fliers advertising career opportunities in the medical field. Keyuna was definitely interested! She inquired about the program, received an application, filled it out, and took the first step to becoming a Certified Nurse Aide. The program Keyuna enrolled in is a unique partnership between El Centro College in Dallas and The United Way. The classes are held on Sharing Life’s campus, the instructors and curriculum are provided by El Centro and the program is funded by the United Way. Classes held at Sharing Life include training in various fields such as Phlebotomy, EKG technology, and Patient Care Technology. Sharing Life also provides support and financial training while they are in the program. Research shows there is a much higher completion rate in a skills training program if participants have financial support and assistance with their other living expenses. Sharing Life provides as much support as we can though food and other assistance available. We are very excited to be able to offer this program on the campus of Sharing Life! This program allows our clients to work their way out of poverty situations and build better financial future. Keyuna now has her Certified Nurse Assistant certification. She has a good job making more money than before when she worked those minimum wage positions. She is now able to provide for her children and is very happy with the decision she made that day in Sharing Life when she saw those fliers. If you or someone you know is interested in finding our more about our medical field training programs, please visit sharinglifeoutreach.org/educational-programs.htm. There you will find more details and program contact information. Are you interested in our medical training programs? Fill out the below form and hit "Submit" and we will be in contact with you soon. Learn more about Sharing Life's mission here. Information about becoming a client of Sharing Life here.